If we all had endless amounts of money, upgrading the home would be 100% enjoyable. The truth for most of us is that we need to weigh our options carefully before choosing to tackle the list of updates we want for our homes! Because the experts here at Brock Doors and Windows know there are homeowners right here in Toronto, ON, preparing to put their homes on the market—we want to help! In fact, we want to provide homeowners preparing to sell with the Top 3 Home Upgrades with Real Payoff! Keep reading to find out what they are to maximize on your resale return. I know… You assume major dollar signs when you think of a bathroom remodel. But, expert reports on home renovations suggestion a way to upgrade your bathroom and master bathroom without spending an arm and a leg: ask your local hardware store what scrap pieces they have available for sale. You can find cabinets, countertops, even faucets this way for a fraction of the cost! Regardless if you choose to go this route or purchase all brand-new materials for your kitchen upgrade, the average return on investment: 102-108%! Now, don’t worry; you don’t have to hire a contractor to put in a retaining wall before you sell your home. But, it’s important that the yard look inviting and well taken care of. Seeding the yard or adding new sod, putting in an attractive bird bath and a few hanging birdhouses, adding a couple large flower pots to the front porch—these are all great ideas to give your yard an inviting facelift. If you aren’t sure where to start, consult your neighbors and visit a local garden center and ask a few yard design questions. The average return on your investment: 100-103%! If you’re looking to sell, you should know potential home buyers are looking for high-quality, new windows. Reasons of safety, thermal insulation (especially here in Canada! ), and operability are among the many reasons buyers are practically demanding new windows in prospective homes. If you live in a densely populated area, replacement windows pay off in a big way—the average homeowner recoups more than he/she spends. Including big city locations and rural areas—the average return on your investment: 89-103%! Isn’t it shocking to learn about these high-return investments you can make in your home? 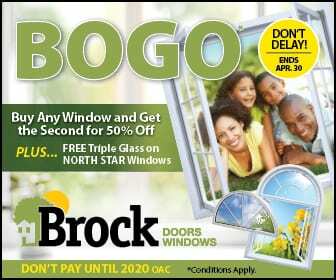 If you are looking to sell, want to increase the value of your Toronto, ON home for better equity, or are just antsy to make improvements you’re sure to love, our team here at Brock Doors and Windows are happy to assist! We can help you with the #3 home upgrade with real payoff—replacement windows in Toronto, Ontario! Our experts are trustworthy, knowledgeable, fair, and experienced. We would love to work with you in the near future! Come and see us!